Added: volume cover, inside cover, sides, contents, character page, authors page, back cover. Minor typo/mistakes fixed in various chapters. *The mediafire had one file corrupted, here it is http://aria.tinybooru.com/post/view/2052? (p38 of nav. 60). Link updated with reuploaded version. In the gondola business, we strive to create "perfect moments" - times when everything comes together to make an absolutely flawless memory. The moment could be ten seconds, or ten minutes long...but the memory will last for years. The better the moment, the more likely those who were there will hold it dear for the rest of their lives. We don't see "perfect moments" during every cruise, but one of my trips tonight had at least five or six of them. Will my passengers remember those moments forever? I couldn't say. But they definitely have their pick of possibilities to choose from. Oh man, we could've used Gondola Greg on the team to rewrite Amano's dreamy, romantikku bits. So, this is it then. Poor Akari, getting delusional from her loneliness. It's a good thing that gets settled later. By the way: doesn't anybody else think that big cat is way creepy? And what's with the other people? Are they all penpals of hers? All in all, it's all quite a bit less melodramatic than the anime, although I still think it's very bittersweet. Huge thanks for this and all the other chapters you've slaved over all this time. It's not often a scanlator takes on a job like this and not only sees it through to the end, but does so in the best quality anyone could ask for. I'm still selfishly going to hope you continue with Amanchu! as well, mainly because I don't think anyone else could do it justice, but whatever happens, thank you. > And what's with the other people? Are they all penpals of hers? I'm sad Mensile Undine, Roman Club, Ohisama, Crescent Noise and the two tanpenshu remain unaddressed. Anyhow, will you release a 14-volume all-in-one Aquarian download with all the corrections? Thanks! >Anyhow, will you release a 14-volume all-in-one Aquarian download with all the corrections? Thanks! We started from volume 7, so no, won't be going back to fix up anything previous to that. If there are mistakes still left in the previous volumes from us, then I don't mind fixing those up. If anyone wants to release a full torrent with everything, feel free to do so but I'd prefer you to not tag it under acs(or tag it appropriately to accordance) - as we have no claim on anything previous to vol.7. thanks so much for finishing it. your efforts are greatly appreciated. I happened on this story by chance a couple months ago and I don't know your entire story behind getting started on this project but I must say thank you for putting this out there to read. I'll be buying the real manga soon as this is something to definitely have in one's collection. And if by some chance you talk with the author tell her I said thanks for a beautiful story =) And thank you for putting it out there for the rest of us to read! Wow... I just thank to you guys ACS!!! Oh and if you are looking for Editor, i want join your team haha.. i wish -_-!! I forgot to ask can I use your scans for translating it in mine home language (Bulgarian). 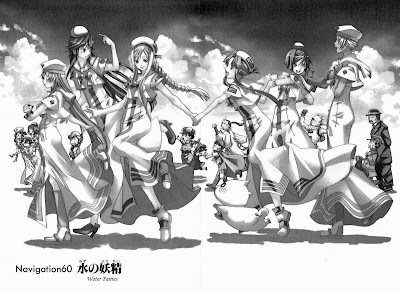 But I am not sure if the scanlating group will let me. It won't hurt to ask at least. >I forgot to ask can I use your scans for translating it in mine home language (Bulgarian). But I am not sure if the scanlating group will let me. It won't hurt to ask at least. Yes, feel free to. Anyone else who wants to TL it from us to any other language is free to as well. Thank you guys so much for all the efforts. Your scanlations really did helped me a lot in BG studying. Want you to know that there are so many people appreciate you guys' work. PS. Any plan on Monthly Undine? Im dying for reading them. PS2. If you are interested in them i could provided you guys the raws though. We'll always remember that there's a wonderful fansub group behind Amano Sensei's works. Thanks for bringing us these wonderful works. I have some problem with arhive on mediafire, i downloaded files two times and get same error in this file. 7zip and windows standart zip support get error on unpacking(test archive), i think, this archive is broken, please, reupload. For me, it says "CRC error" when unpacking 038.jpg from Navigation 60. Get Chapter 60 from the single release, take 038.jpg from there and replace the one in the volume 12 archive. thank you so much, i was waiting for this long time ago. And just when my Aria stuff arrived too. Thank you, everyone, for your patience and perseverance. But like Richard Adams said, "That music has ended; now there will be silence." Thank you very much for translating this awesome series. It is my favorite manga to date, and as it goes, it's likely to be for the rest of my days. I, too, am grateful that you stuck with it to the end. I don't think Tokyopop will show it the same kind of courtesy, sadly. Many thanks for your nice work! To the ACS team: thank you so much for seeing this through to the end and doing us Aria fans all a wonderful service. I'm truly grateful for all your hard work. To those wondering about Akari's diary: Remember, it's the internet she is blogging on. Someone you met in RL could be someone you know on the internet, or vice versa. Also, for the Monthly Undine: They will take a lot of work. Colour pages, Advertisements in colour pages will probably make cleaning a pain, and there is probably more text in the 25 pages of a volume than several volumes of the manga put together... I have the physical copies for vols 1-3, 5-6. Been trying to find 4 for as long as I can remember now... I need my last 2 Aria Shachou mini figures. Lol. I cannot find suitable words to describe how happy I am to find out that Aria is finished!! Thanks so much for completing the series, I've been waiting to read it for so long. I can't believe that there will be a day when I can finally read all 12 volumes!! I'm so grateful for everyone's effort in making this series available to us. Thank you very much for completing Aria~! Just wondering, was either page 20, 21, or 22 (from chapter 57) missing? between page 19 and 23 there were only 2 pages. Again, thanks and thanks and thanks!! The cover of 57 is a double spread which has been rotated. Final words not on aria, but on your work. You did a fantastic job, it was probably alredy said often, but can't be said enough, though I have the original in two languages (english and native), whenever I want to (re-)read old aria chapters, I chose your work, as your translation is so much better then the oficial ones. I really thank you for that hard and fantastic work, that no oficial outside of Japan publisher could seem to be able to match. Hi. I'm wingdam from vnsharing.net forum. I want to ask you for permissions to re-translate ARIA into Vietnamese. Of course, We'll keep your credit. "I am just a little happy"
What a perfect line to end the series. It just sums up everything about Aria, I love it. Finally the last volume came out in this country of mine. Thanks again for doing such a good job in translating, itputs Tokyopops efforts to shame. I've been downloading all the ARIA volumes onto my computer recently, since I discovered that the scanlations available online were pretty messed up in order and a lot of chapters were missing. I'd like to thank you for the great job you've done with the scanlations - they're much higher quality than I'm used to! I'm also enjoying your current work with Amanchu. 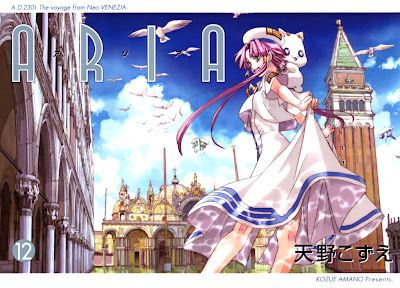 Archive of all previously translated ARIA chapters, courtesy of AriaFag - credit goes to whoever translated them. monthly undine: who wants to finishing tling this? contact me.